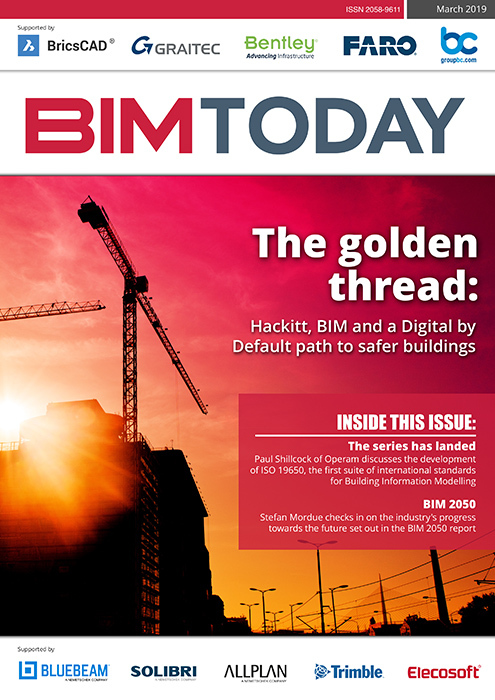 Welcome to the December edition of BIM Today. 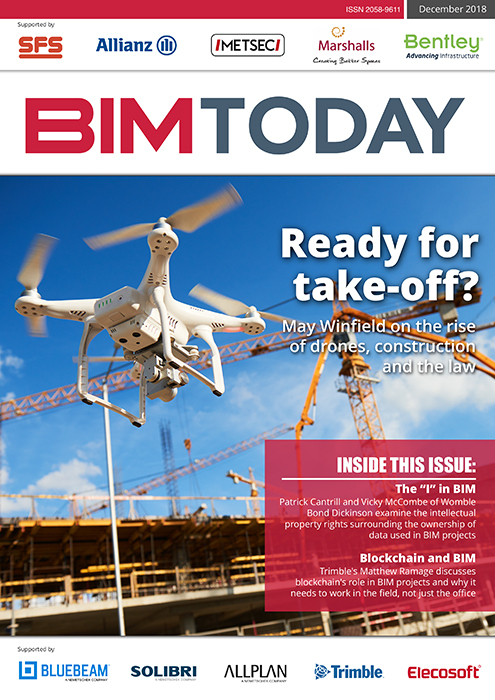 In this issue of BIM Today, we look at the legal issues surrounding the use of drones, the intellectual property rights surrounding BIM data and Transforming Infrastructure Performance, the government’s plan to improve the productivity of how assets are planned, designed and operated. Elsewhere, Matthew Ramage of Trimble examines the practicalities of adopting blockchain technology to BIM in the field, as well as the office. We also have Eugenio Quintieri of the European Builders Confederation and Sue Arundale of the European Construction Industry Federation on the BIM-SPEED project, which aims to employ BIM tools to greatly improve the energy efficiency of building renovations. There’s much more besides, from using Modern Methods of Construction to tackle the housing crisis and the importance of industry culture in maximising the benefits of technology to e-learning, attitudes to proptech adoption and the UK projects recognised at the Year in Infrastructure 2018 Awards. Drones: What risks in taking flight? Drone technology has been hailed as a game-changer for the construction and engineering industries. But where do the benefits come from – and what are the risks? Senior construction solicitor May Winfield explains where the law stands on drone use. Patrick Cantrill and Vicky McCombe of law firm Womble Bond Dickinson examine the intellectual property rights surrounding the ownership of data used in BIM projects. Alex Lubbock, head of digital construction at the Infrastructure & Projects Authority, discusses Transforming Infrastructure Performance, the government’s plan to tackle the issues that limit the performance of UK infrastructure by improving productivity in the way we plan, design, build and operate assets. Horizon 2020 project BIM-SPEED is making BIM a harmonised “building information speedway” for energy-efficient renovation works. Eugenio Quintieri of the European Builders Confederation and Sue Arundale of the European Construction Industry Federation outline how it will work. Blockchain and BIM: Does construction really need this right now? Matthew Ramage, segment manager for asset management at Trimble MEP, takes a look at the relationship between blockchain and BIM. Invest in proptech before you need to use it, advises Anthony Walker, as he looks at surveyors’ attitudes to adoption. We hear a lot about the benefits of digital transformation and BIM in the construction industry – but in order to truly realise the benefits, we must first accept the cultural and behavioural changes necessary, argues Andrew Carpenter of BIM4Housing. Offsite manufacturing supported by BIM, 3D printing and AI has the potential to transform the way we build – but it is yet to become ‘business as usual’. Robert Meakin, partner at global law firm Clyde & Co, discusses recent research looking at what is holding back that tipping point. The Year in Infrastructure 2018 Awards celebrated extraordinary work in the design, construction and operations of infrastructure around the world. BIM Today highlights two UK projects that took home the top prizes. A new e-learning platform from the Construction Scotland Innovation Centre aims to help more business leaders start their BIM journey – without having to get out of their chair. BIM technical consultant Colin Hastie explains.